I had the privilege to once again meet my fellow mommy bloggers yesterday morning at the Johnson & Johnson’s Bedtime Believer Awards event held at Aquaknox Restaurant and Lounge located at 800 Arnaiz St. corner Amorsolo, San Lorenzo Village, Makati City. The Bedtime Believer Awards is a special ceremony to celebrate all mommy bloggers who believe in giving babies around the world faster growth through good sleep. 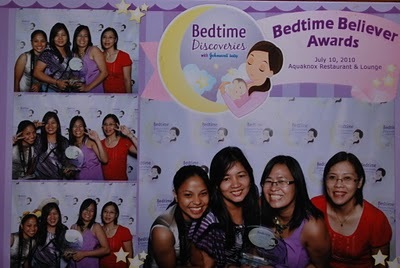 The event was hosted by Caren Bayhon-Yrastorza, a fellow blogger and a Johnson & Johnson’s bedtime believer herself. There were three awards (with gift certificates) given to three mommy bloggers, namely: The Science of Sleep Award, The Magic of You Award, and the True Bedtime Believer Award. The first Bedtime Believer Award, The Science of Sleep Award, was given to the blogger who made the most comprehensive post about the science of sleep and the three-step bedtime routine. The recipient of this award is Ivy of MommyCow. Next, the Magic of You Award was for the mommy who tried the Johnson & Johnson’s bedtime routine and just like magic, it worked for her child! She said that the bedtime routine enhanced her relationship with her son. Joana Paula of Happy Thoughts was the lucky mom to receive this award. She did not make it to the event, though. Finally, the True Bedtime Believer award was given to the blogger with the most number of blog posts all throughout the Bedtime Discoveries events. The awardee is none other than Pehpot of Make or Break. Now, this calls for a celebration! I saw Mommy Salen of Sassy Mom’s Corner at the event and met new bloggers, like Peachy of peaches and things and his cousin Rome of Romepedia and Mec of Mec as Mom. We went home with a souvenir bag and Johnson & Johnson’s products but not before we had lunch. So, when’s the next Johnson & Johnson’s event? This entry was posted in Bedtime Believer Awards, Blog Event, Johnson's Bedtime Discoveries. Bookmark the permalink. Nice Mommy, good to know that you really take time to attend bloggers event. I wish I could do the same. ang saya nyo naman .hope maka attend din ako sa isa sa mga gatherings nyo . Wow buti naka attend kayo, swerte nmn n Peh, sulit, ano prize nya? btw. x-link tayo. I will add you na. ← What Causes Hair Loss?